The Knights looked promising with four-returning lettermen. They remained undefeated through every MS-9 bout including a sellout game with Peoria High. The Knights only fell once to upstate Thornton, to take second in the Pekin Holiday Tournament. The perfect conference record got Richwoods its second consecutive crown. It was only the second time in conference history that a perfect record had been accomplished. The Knights were led by Chris Williams with 801 points that season which was a school record. Other players that performed outstanding that year were Kevin Westervelt, all-conference guard; Derek Holcomb, a defensive specialist and all-conference center; and Jim Hohstadt, conference leader in free-throw shooting. The Ricwoods Regional proved to be two of the best games they played all year. They set a school scoring record with 121 points in defeating Canton. In the title game they defeated Galesburg and won a chance to meet arch rival Peoria High in the Sectional. The Knights were able to avenge their loss from last year and beat Peoria High and advance to the Super Sectional, where they defeated North Central Sterling Warriors. The Knights found themselves in the Elite Eight for the first time. They won their first game at state then dropped the last two to finish fourth in the state. The Knights finished with a 30-3 record and 16-0 in conference play. Front Row: (from left) Ray Fisher, Mel Schafer, Chuck Manning, Bill Porter, Roddy Thompson, Stan Wallace. 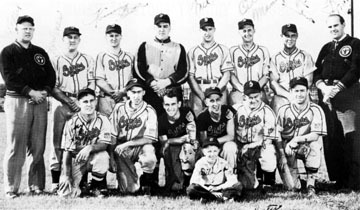 Back Row: (from left) manager Harold ìRedî Koeppel, Don Jones, Tommy Butler, Bill Perry, Mel Burdette, Bill Manuel, Jim Sanders, business manager Harold Neef. In front: batboy Billy Porter.